Two thousand eighteen may be remembered in retail marketing history as the year discussing CBD moved from Bon-naroo to the board room. Extensive media coverage; legalization of all forms of cannabis in Canada and parts of the U.S.; a tsunami of benefit claims; a flood of new CBD products across a broad spectrum of categories; passage of the 2018 Farm Bill, which makes hemp-based CBD legal in all 50 states; and — most importantly — significant consumer interest and receptivity are increasingly making it difficult for chain drug retailers to ignore. As we explained in our first article in this series, which appeared in the January 21 issue of Chain Drug Review, CBD is short for cannabidiol, one of over 100 cannabinoids — or active constituent compounds — found in the hemp plant. Unlike some cannabis compounds, CBD is not psychoactive. In our last article we used the beverages category as an example of how CBD products could transform a traditional chain drug store category. This month we examine CBD’s potential impact on other core chain drug store categories — skin care and cosmetics and personal care. We also want to look at the critical questions chain drug retailers need to be asking themselves as they start thinking about the role CBD could — or should — play in their long-term category development plans. Of course, for any retailer, the most critical question ought to be, “What do consumers want?” And, increasingly, the answer seems to be products containing CBD. Consumer perception often translates into marketing opportunity. A.T. Kearney surveyed 1,000 American and Canadian consumers to see what they thought of CBD. When asked, “Do you believe that products derived from cannabis or containing cannabis can offer wellness or therapeutic benefits?” a staggering 79% of respondents “strongly agreed” or “agreed” with the statement. We want to take a deep dive into the demographics of those responders. Some retailers may think CBD products are only attractive to younger shoppers, but they would be wrong. A.T. Kearney’s research found older shoppers equally receptive to the idea that CBD products have therapeutic benefits. Seventy-eight percent of respondents in the 18- to 22-year-old age bracket were in the “strongly agree/agree” camp, but so were 83% of 23- to 32-year-old respondents; 86% of those between 32 and 42; 79% of those 43 to 52; 77% of 53- to 62-year-olds; and 74% of respondents 63 years old or older. Since CBD can be used in a variety of forms, from ingestible products to topical applications, we looked at how open respondents were to specific categories. Asked, “Some therapeutic products infused with cannabis are legal and do not give a high. Which would you try?” 55%answered food (candy, chocolate snacks, cooking oils and packaged food); 43% said they would try skin care, cosmetics and fragrances; 32% said they would try a nonalcoholic beverage; 19% said they would try a beverage with alcohol; and 50% said they would try vitamins, supplements and other edibles. 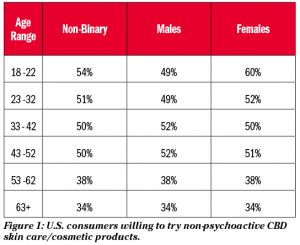 Figure 1 looks at the age and gender breakdown of U.S. respondents who indicated they would try a nonpsychoactive, legal skin care or cosmetic product containing CBD. The drop across all age groups is critical and suggests that skin care and cosmetics consumers are looking for perceived therapeutic benefits, but not a “high.” This underscores the critical importance of customer education about the properties and effects of CBD. We asked consumers, “If a large, well-known company was associated with cannabis, would your perception of that company change?” Eighty-two percent of respondents said that they would have an improved/unchanged perception of cosmetic branders using cannabis. Eighty-nine percent of respondents said the addition of cannabis products wouldn’t change or would improve their perception of branders in the personal care category. The upside potential in these categories is readily apparent. 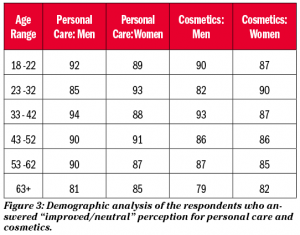 In both the personal care and cosmetics categories, the highest frequency of “improved/neutral perception” responses came from 33- to 42-year-old men and 23- to 32-year-old women. Figure 3 breaks down the overall “improved/neutral” perception numbers by age, gender and category. We believe that CBD products represent a compelling opportunity for retailers looking for ways to breathe life into flat categories and attract new consumers. But, beyond that broad assumption, retailers face a battery of unanswered questions regarding everything from how to merchandise CBD products to how to set up a sustainable and efficient supply chain. The decision to engage in any new market is binary — either you decide to enter it or you don’t. If you do decide to get involved, there are the standard three strategic options associated with any innovation: You can be a pioneer or a fast follower, or you can wait and see if the market settles once the pioneers and fast followers have tested its limits. Ultimately retail executives have to decide which strategy is best for them, and the “right” answer might vary significantly by company. But whether you opt to surf the CBD opportunity wave, or sit and observe it, you will have to explain your strategy to your internal and external publics. 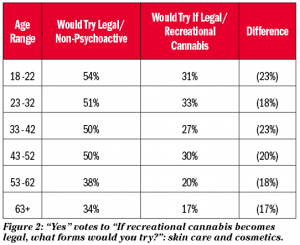 Earlier in this article we pointed out a nearly 20% drop in respondents’ willingness to try skin care or cosmetic products with cannabis when the question didn’t specify the psychoactive properties, or lack thereof, of the cannabinoids used in the product formulation. While our survey results indicate that 76% of respondents knew there were two kinds of cannabis — one that is intoxicating and the other that is not — it’s clear that products need to specify which compounds are being used as ingredients. And that requires a sophisticated consumer — and associate — education and communication program. One critical element of the program ought to be avoiding directly endorsing health and benefit claims. While some CBD advocates claim it is the new wonder drug, the scientific and medical communities haven’t rushed to recognize and certify all those claims, at least not yet. Be careful what kind of information about these products you make available to your customers, and make sure your staff toes your company’s — and not the supplier’s — line. There are a number of competing claims. For example, just Google the topic and you will surely see myriad articles arguing CBD’s merit as an anti-inflammatory agent; its pain relief properties; its ability to ease cancer-related symptoms; its power to reduce acne, relieve spasms, prevent diabetes, boost heart health and help with substance abuse problems; and its qualities as an antipsychotic and antitumor treatment. Retailers should feel convinced by the claims offered in CBD suppliers’ products. We suggest that if you do decide to aggressively pursue the CBD market, you should conduct a formal exercise to get yourself prepared. We don’t pretend to have all the answers, but we have a good idea what questions you need to be asking. • Should CBD products be sold in a stand-alone section or integrated by product category/subcategory? • Should they be integrated into category sections, but segregated inside the sections? • What role do CBD products play in your overall category management plans? • Do you need “organic” CBD products? • What about the role of own label? • How do you set up an effective CBD supply chain? • How do you guarantee sustainability of supply? • How do you guarantee product purity/safety? • How do you find suppliers in the first place, and how do you check their credentials? • Do you contract with boutique producers or wait until major CPG companies bring products to market? • Are there regulatory issues across your trading areas that require special attention? A.T. Kearney’s research demonstrates that, in contrast to other functional foods and supplements and other “miracle ingredients,” a much higher percentage of consumers already believe in cannabis’ health and wellness benefits. Whether or not the science verifies these beliefs isn’t the question. 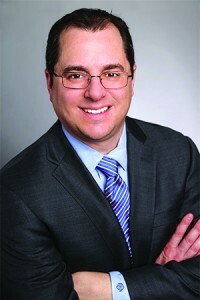 Professor Ted Kaptchuk of the Harvard-affiliated Beth Israel Deaconess Medical Center is an expert on the “placebo effect.” His research has demonstrated that by building a stronger connection between the brain and the body placebos can — in some circumstances — be as effective as traditional treatments in terms of mitigating certain symptoms, particularly in areas such as pain management, stress-related insomnia and the side effects of cancer treatments. So, if consumers believe that CBD products produce certain results, it’s likely that they will produce these results in a large number of cases. Our advice is to look at these products in the same way that you would evaluate any new product — through the eyes of the consumer. We encourage chain drug retailers to fully understand the scale of this opportunity, determine how cannabis products fit into their overall health and wellness strategy, and, if there is a good fit, move quickly to create an advantage and capture what consumers see as true innovation. And, above all, think through all of the questions we suggest and more before you make a major commitment. Fortune may favor the brave, but ultimately it rewards the ­prepared. 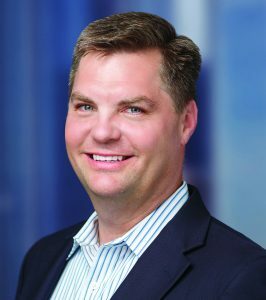 Randy Burt is a partner in the consumer and retail practice of A.T. Kearney, a global strategy and management consulting firm. He can be reached at Randy.Burt@atkearney.com. Todd Huseby is lead partner in A.T. Kearney’s pharmacy sector practice and can be reached at Todd.Huseby@atkearney.com.